There is a legend in Portugal centuries old, and it involves a rooster. So as the towering prospect and the hopeful assistant coach toured the hometown of this 6-foot-11 big man whose wingspan already spreads a massive as wide as seven feet, five inches, the question was eventually posed. What’s with all the roosters? Eric Peterson saw them everywhere in Barreiro. In apartment windows. In quaint shops. All over. Neemias Queta eventually told the story of the Barcelos Rooster, the unofficial symbol of Portugal, that defines the country’s love for life and why the rooster is considered a sign of luck and happiness. Story interpretations have varied over the centuries, but as Queta explained to the Utah State assistant, it means something to the people of Portugal. Which is precisely why it’s seen all over, this national token of good fortune. It’s also why, when he flew back to Utah after time hopping around Europe, Peterson brought back two paperweights of the Barcelos Rooster. One for himself and one for Utah State head coach Craig Smith. He explained to Smith the significance of the rooster. Because at the time, it was unclear if Queta — now an impressive, impactful true freshman center patrolling the paint in Logan — would make it in time. This summer, he spent time playing with the Portuguese U-20 national team in Bulgaria, just the latest step in his continuation as one of the emerging young prospects in the European game. 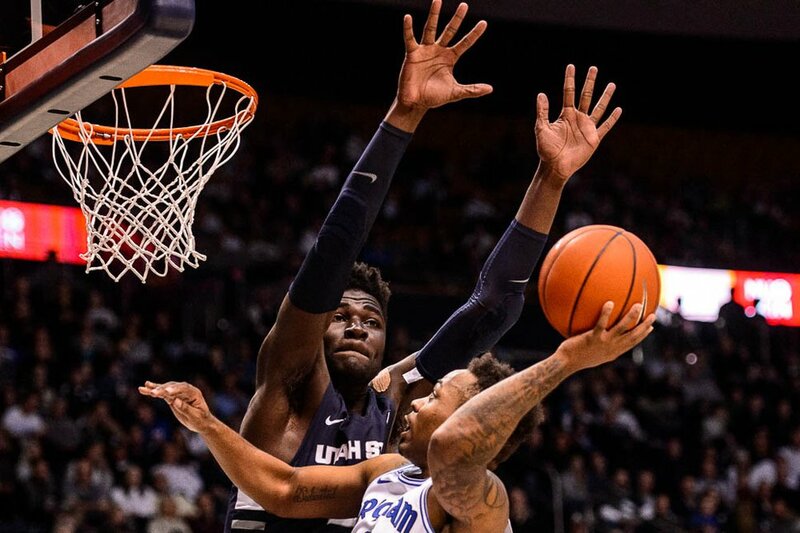 What a find » USU began recruiting Queta in the spring and the Portuguese big man eventually enrolled in August after playing with the Portuguese U-20 team this summer. Queta is averaging 9.4 points per game, 7.9 rebounds and a Mountain West Conference leading 2.3 blocks per game. Queta already has 28 blocks through USU’s 9-3 start to this season. But international teams and tournaments usually equal delays when it comes to international prospects fulfilling all the necessary paperwork to move to the U.S. to play college basketball. In order to get to the place he’d never been, to play for the head coach he’d never met in person, Queta had to meet numerous benchmarks to even board a plane for this new adventure. Transcripts needed translating, appointments with the embassies needed completing, and the NCAA clearinghouse had to green-light his move. As for that needed luck? The paperweights paid off. The Aggies eventually announced Queta as a new member of the program in late August. And since, he’s proven exactly why Utah State deemed him such a cornerstone of this new era of Aggie basketball. “The sky’s the limit for him and nothing will surprise me with what Neemias accomplishes in his future,” Smith said. Long before the loud blocks and the rim-rocking dunks and the dominant nature in which he can snag a rebound, Neemias Queta was just a tall 10-year-old who saw his older sister get an invite he, too, wanted. He followed his older sister to a basketball tryout in Barreiro and there at the gym in his hometown was a men’s basketball team practicing. He jumped in. Barreiro is a basketball town. In a soccer-obsessed country like Portugal, who has arguably the world’s most recognizable superstar athlete in Cristiano Ronaldo, Queta ditched the pitch for the hardwood before becoming a teen. As he grew, so did his popularity in Barreiro. When Peterson visited Queta for the first time this summer, the kids in the apartment complex where Queta lived swarmed him when he came home. “Everybody in that area knows who he is,” Peterson said. He was a known commodity in the college basketball world, too. Queta’s final four were Utah State, Texas Tech, Saint Mary’s and Creighton. This first-year staff in Logan needed size, strength and a big to develop for the future. Queta checked all those boxes and then some. Especially after USU lost two big mean to knee injuries. During his days as an assistant coach at Colorado State, Smith made trips to Europe to scout. Peterson used to be a junior college head coach and established basketball contacts in Europe, too. When Queta’s name was brought up as a player to watch, Smith and his staff went to YouTube to get a first look. It’s different these days, Smith said, who remembers his days as an NAIA head coach trying to call European recruits on an international calling card. Recruiting now can involve a FaceTime call, and it’s simple as that. USU began recruiting Queta heavily in May. Smith and Peterson made sure to be able to answer any questions Queta had during the process. There were plenty. He sought out a lively game night atmosphere, so he looked up old footage of The Spectrum in Logan, when fans made it as hostile a arena as any in the country. Queta decided this spring to pursue options in the U.S. Like most players, he’s long held aspirations of playing in the NBA and wanted to test himself against higher level of competition. (Trent Nelson | The Salt Lake Tribune) Brigham Young Cougars guard Jahshire Hardnett (0) shoots with Utah State Aggies center Neemias Queta (23) defending as BYU hosts Utah State, NCAA basketball in Provo on Wednesday Dec. 5, 2018. Since his late arrival in Logan, he’s stepped into a starting role, basically out of necessity. He’s averaging 9.4 points per game, 7.9 rebounds and a Mountain West Conference leading 2.3 blocks per game. Queta already has 28 blocks through USU’s 9-3 start to this season. With him leading the way, USU is ranked No. 6 in the country in defensive rebounds per game. Admittedly, Queta has had a leg up compared to most true freshman: he grew up playing against adults when he played with club SL Benfica B last year. Adaptation is a test for any freshman, let alone one who just uprooted from everything they’ve ever known, to move away from a place where you can swim in the bay and see Lisbon in the distance to a place like Logan, where in the winter, it’s white and freezing. “Everything is hard, basically,” Queta said. Neemias Queta is learning. It’s taking time. He misses his family. He misses his friends. He misses being able to get to the beach by bus. He learned to write English in school, but learned to speak more fluently through watching movies and TV shows like “Prison Break.” This new routine, he explains, is something that will take more time to get used to. On the court, too. In Europe, refs let contact fly more often. Queta is still learning how to stay out of foul trouble. After helping lead USU to a win over Weber State at the Beehive Classic earlier this month, Sam Merrill joked that Queta must learn “how to stop fouling.” Queta has fouled out in two games so far this year and has been saddled with foul trouble in others. But, fairly or not, that’s life as a big man, especially in today’s game. Smith said sideline conversations about foul trouble now result in big bear hug from Queta. Queta admits it’s been tough, but he is enjoying this transition, too. Smith said he anticipates Queta put on 15 pounds the first few weeks he was on campus, telling a story of Peterson introducing the USU student cafeteria to the school’s new starting center. Yes, he told Queta, it’s buffet style. Smith said he continues to remind himself that despite his imposing stature and experience in the game, his center is still a freshman learning something new every day so far away from home. There are subtle reminders, though. When Smith has the team over for team gatherings, Queta walks into the house and is mobbed by the children of the USU coaching staff. Just like back home in the apartment complex in Barreiro.